How Long Does it Take to Make Sunday Dinner? In my effort to prove that cooking healthy food does not have to take a long time, I got a wild hair last Sunday and asked Justus, our 12 year old, to time me to see how long it took me to prepare our noon meal. Anyway, knowing that this was a very healthy, yet very easy meal to put together, on Sunday I asked Justus to see how long it took me to make our lunch. I had not done anything ahead of time. The crock pot was still in the cabinet. The roast was still in the freezer. I finished the job by sprinkling on some Italian Dressing Mix that I had already made up and had stored in my pantry. I plugged in the crock pot and turned it on (always recommended). Then, I was done. Justus, how did I do? One minute, forty eight point nine seconds. Total. To make a complete meal for my family to come home to and eat after church. What’s one of your favorite, quick and easy Sunday meals? Frozen meat in the slow cooker is one of my favorite ways to cook. The only thing you need to watch out for is ground beef as sometimes you may need to drain the fat. more tender a lot of times too. 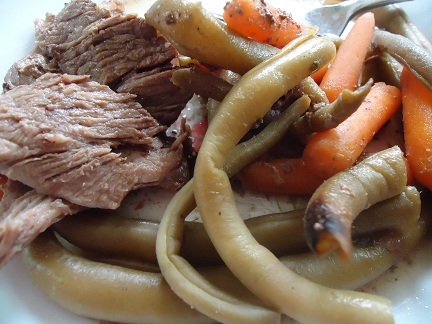 Ahhh… I couldn’t turn out a good tender roast to save my neck till I began doing it from frozen in the crockpot. And if the chicken will fit, I do them that way too, then just throw the bones back in later and make broth – don’t clean the crock out till after the broth is done cooking. Baked Potatoes in the crockpot…works really great if your feeding a crowd, too! Fill up a huge roaster full of tators (cleaned, poked and wrapped in foil) and let ’em go! my favorite for sundays is a whole chicken with garlic cloves. So glad my house is not the only crazy house sunday mornings. Yeesh! I bought the 7 Qt Crock Pot (brand) slow cooker and it has a snap closed lid to transport. “We” are only “3” but I cook and freeze other portions for ‘later’. SUCH a treat to just ‘heat-n-eat’. I always thought the frozen meat thing was dangerous too but you could always cut the roast in half before freezing it and it would cook to past the danger point quicker, right? When I do a chicken I take a few basil leaves, a sprig of rosemary, a sprig of parsley and wrap them with a bunch of garlic chives and stuff the chicken with that after dusting it inside and out with Lawry’s seasoned salt and garlic powder. Now THAT’S an aroma you want to lie down and die for. Oh, and I always cook 2 chickens at a time and sometimes freeze one whole or zip lock breast for later chicken salad etc. Salsa Chicken is really good in the crockpot! Just put your chicken in the crock pot, and dump salsa on it! And if you are feeling sassy add some corn to it LOL! I need to buy a new crockpot b/c I sold mine, because I thought it had lead in it =( I’m trying to find a lead free or more so then the one I had…any recommendations? I have this crock pot from Hamilton Beach: http://www.amazon.com/gp/product/B00006IUTI?ie=UTF8&tag=wwwheavenlyho-20&linkCode=xm2&camp=1789&creativeASIN=B00006IUTI. After some research, it seemed to be the safest, lead free crock pot. Thanks so much I’ll check it out!! My friend gave me a recipe – you put one can of kidney beans, and one can of black beans (I can my own beans, so I use one pint of each) then a few chicken breasts and throw a jar of salsa over the top (I also can my own salsa, so I put in one pint). Cook in the crockpot for about 4-5 hours and then pull apart the chicken. Serve in tortilla shells, cover with cheese & sour cream……it’s so good. So if you put a roast in the crock pot still frozen, what is the cooking time? I did ours for about 4.5 hours on high. We always eat dinner at church with everyone else. I generally take some sort of soup or stew which I throw together Sunday morning. This morning, I used leftover baked potatoes, leftover boiled potatoes, leftover sausages, a cup or so of goose meat picked off the bones and two quarts of broth from said bones, a few bits of leftover chicken, two chopped onions, a quart of canned carrots, and seasoned it with salt and Italian seasoning. It took maybe 15 minutes to put together, with all that chopping, and made about 7 quarts. We brought enough home for tomorrow’s lunch, so that’s two meals for the time I spent making it! 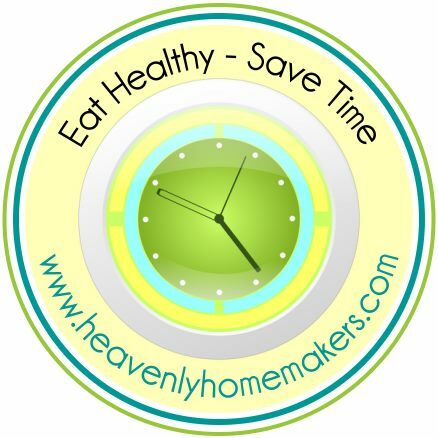 Healthy food does not need to take very long. I generally try to take the time to sear my roast before I put it in the crock pot (which takes all of what, 10 minutes extra tops?). If I’m really pressed for time I will put it in without the extra step, but it really makes a big difference in the flavor! Same thing goes for the meat when I make beef stews, stroganoff, and such – definitely worth the time if you have it! Really? I always put my frozen meat in the eve. before, adding the veg. in the morning. Just morning cooking is enough? High, low, how many hours? Love the less than 2 minutes! That is less time than you might spend in the drive-through. I love the smell of a homemade meal when you come in the door after church.